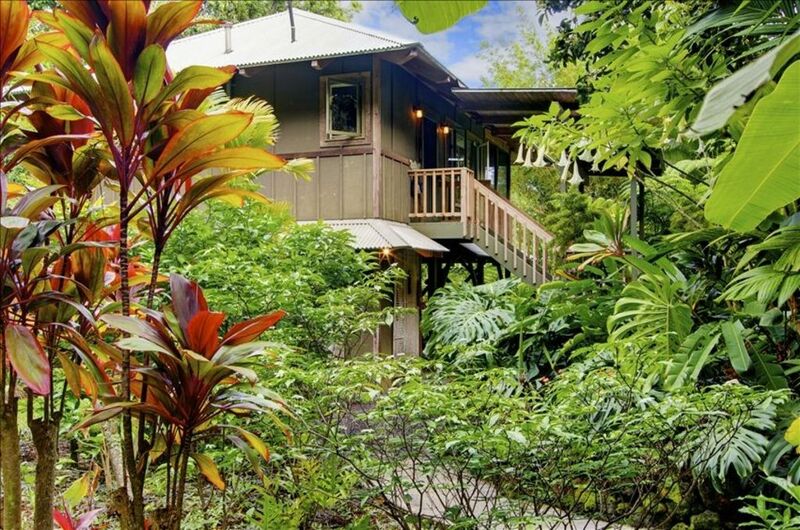 The Hamoa Bay Bungalow is HANA MAU'Is most charming vacation hide-away. Balinese inspired, private, with ocean views, secluded and romantic. Just beyond sleepy Hana Town... this property is tucked in amongst lush ferns, banana trees, bamboo, colorful heliconias, fragrant ginger, papaya, century old trees, and manicured gardens. Enjoy sea views from the verandah. Listen to only the sounds of the birds, the geckos chirping, and the stones rolling in the surf at night. 'Jungle romance.' Bordered by ancient rock walls, this Bungalow, architect designed, Balinese inspired, is the perfect quiet hide-away for two. Indulging yourself means a languid afternoon sprawled on the giant bamboo bed amid the perfume of jasmine and ginger blossoms, a soak in the built-in Jacuzzi tub for two on the screened verandah, looking out to sea and jungle views. Treat yourself to a shower in your private lava rock enclosed outside shower in the garden (we do have indoor shower as well). Hammock, barbecue, lush, manicured private gardens are also provided for your pleasure. If contact with the outside world should become necessary, phone, Wifi, and TV/DVD are available. You can walk to Hamoa Beach. Gold filter and coffee grinder provided. Coffee and assorted spices and condiments available. We really enjoyed our stay in the Bungalow! It's in a wonderful, secluded, and lush location a few minute drive from Hamoa beach and a short drive from Hana. Everything is very comfortable, romantic, overall perfect for a honeymoon or similar stay.. Note that you'll definitely see some small lizards both inside and outside, including a few species of geckos (and you'll also hear the geckos "chirping" at each other night) as well as anoles. For better or worse, these small lizards are unavoidable across Maui and especially in the lush Hana area. We loved them: they are cute and completely harmless (they eat tiny insects) and often kept as pets. The house and property were exactly as described on the VRBO website. The only other humans nearby would be in the adjacent house which also gets rented, but due to beautiful, lush gardens and trees you cannot see the other house from the Bungalow, ensuring deep privacy. The only way we knew there were people in the other house was seeing their cars in the driveway from time to time. Otherwise, no people for what felt like miles. Gardens around the house are lush and well kept. House is clean and well equipped. Two things to understand about the property in advance: no air conditioning and bugs / small geccos get inside (unavoidable). I do not count these as negative due to the nature of this property, but some people may not accept the more “natural” style of living in this peaceful, remote oasis. Robin was attentive and available by phone or text during checkin and she checked on us during our stay to make sure we were comfortable. She also really helped us out of a stressfull situation when we had a screw cause a slow leak in our rental car tire, and there are no service station on this end of the island. Robin directed us to the general store where a gentleman performs tire repairs (who would guess?). Until I contacted Robin, our best solution was to drive back the entire Hana Highway with fingers crossed that the tire held air, not what we wanted to do. Tire was repaired for 8.33! Cheap, especially considering we had no other option and they could have gouged us. We got exactly what we wanted from our stay here; a peaceful tropical retreat away from the hustle and bustle of the more trafficed tourist resort areas. The perfect Hawaiian get away! Absolutely loved Hana and the bungalow. Couldn’t have been a more perfect way to spend the week here in paradise. Tucked away so quietly with the ocean view. It’s truly paradise! If you are staying in Hana this is a perfect place to stay! Minutes from the beach, private, beautiful scenery, the list goes on. Robin was also a wonderful host and ensured we had everything we needed! Loved this bungalow, not too far from town with wonderful food trucks, no A/C but usually was okay if you’re out and about adventuring the area during the hotter parts of the day. Our stay at the Hanoa bungalow was perfect. After a beautiful drive to Hana, the bungalow provided a well needed rest! Perfectly located near Hamao beach (one of Maui’s best beaches) and Hana, the bungalow offers a place to escape the hustle and bustle of the Maui’s west side. The bungalow is the most amazing place to honeymoon, I dare you to find better!! Completely private set in a beautiful garden with a view of the ocean. Staying on the Hana side is the way to go, you can miss all the crowds in the morning and late afternoon—we had the Venus Pool all to ourselves one morning! Can’t recommend this place enough, excited to come back some day!